Edition of 1919 of which 300 copies are signed 1-300, 26 copies are signed A-Z as artist's proofs, and 5 sets are signed as progressives. 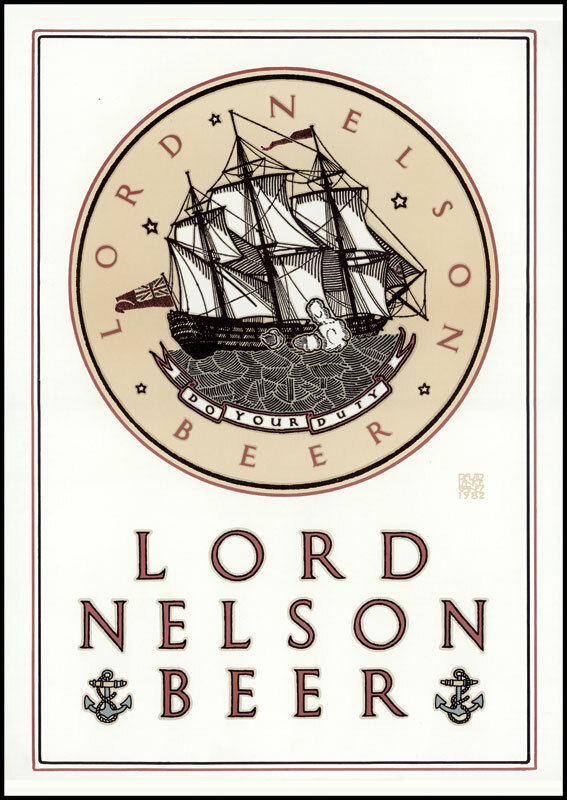 March 28, 1982 5 colors 17" x 24"
Client: David Lance Goines, The Lord Nelson Brewing Co., Berkeley CA A-Z: artist's own use. Progressives: Thackrey & Robertson. As Woody Allen said, "Man does not live by bread alone. Occasionally, he requires a beverage." Beverage. Where in heaven's name did that word come from? What man actually occasionally requires is a drink. You don't go into a bar and say, "Bartender, my best friend just died. Give me a beverage." You don't even say, "Bartender, give me an alcoholic beverage." The modifier usually goes with "drink," as in, "Mommy, I need a drink of water." "Drink," by itself per se, means something with a kick to it. When you go into a bar and you ask for a drink you aren't ever asked if you want a glass of milk. "Drink" doesn't even mean champagne or any of that friendly stuff. It means Booze, Old Mule Kick, What Made the Preacher Dance. You know, the Real Thing, and by this we do not mean sweetened, flavored, carbonated water. When the pomaded Lothorio says, "Young lady would you like a drink?" he doesn't mean Kool-Aid, soda pop or a chocolate malt. He means to reduce her inhibitions to zero so he can get her into the sack. Gatorade probably won't work. When I say I want a drink I do not mean that I want a beverage. The word "beverage" could be stricken from the English language and nobody except advertising agencies would even know it was gone. When you want a drink of something without alcohol in it you could say something like, "May I have some juice. I want a drink of juice." The word "drink" and what it means does not demand the creation of a new word that means something without alcohol in it. This is the sort of thing that happens to our mother tongue when stewardesses get their mitts on it. On the airplane they could just say, "We will be serving drinks." Which is how they talk, emphasis in strange places and all, and if you don't want a drink you could ask for water or coffee or soda pop or milk the way you do anyhow. Beverage indeed.